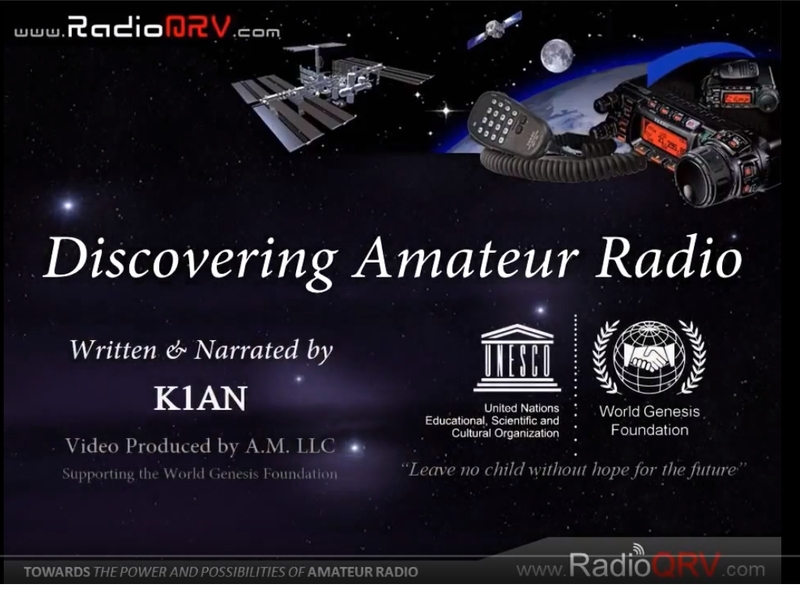 RAST plays a role in social networking to share information, pictures and videos of interest about amateur radio. You can follow developments on our Facebook page or by following RAST on Twitter or watch our videos on YouTube. Click on the images at left or the links above to learn more. About RAST, a brief profile of the society. 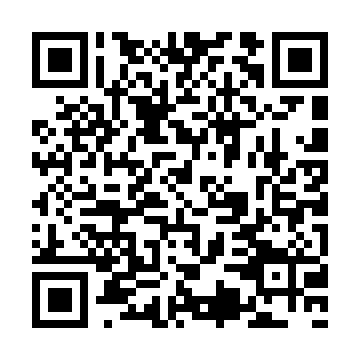 Application form to become a member of RAST that you can fill in online. Enter your data and then click "Submit by Email" or "Print Form"
Due to many special events and long weekends this month (to observe Chakri Day as well as the Qing Ming festival on the first weekend of April and then for the Songkran Festival from April 13-15th) there will be no RAST monthly get together in April, 2019. Instead, the next RAST meeting will be held at Sena Place Hotel on Sunday, May 5, beginning at 11.30 a.m.
Wishing everyone a very happy Thai New Year (Songkran)! 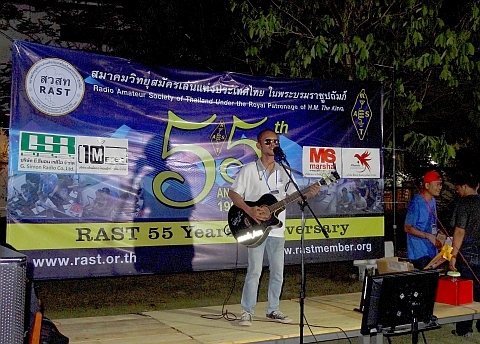 Art, HS4LKW, plays the guitar on stage during the evening of the RAST 55th Anniversary Party. 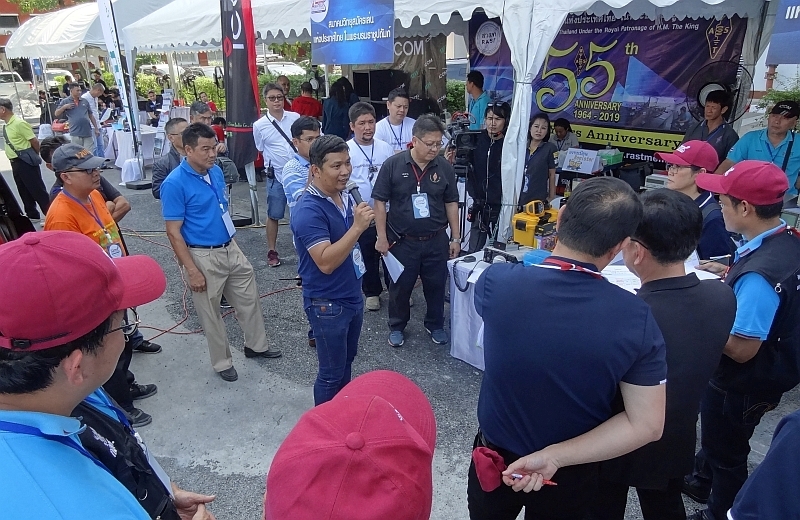 The Radio Amateur Society of Thailand under the Patronage of His Majesty the King (RAST) celebrated its 55th Anniversary at Sripiamsuk Resort on Saturday, March 2, 2019 with a day-long event attended by almost 500 members and guests. 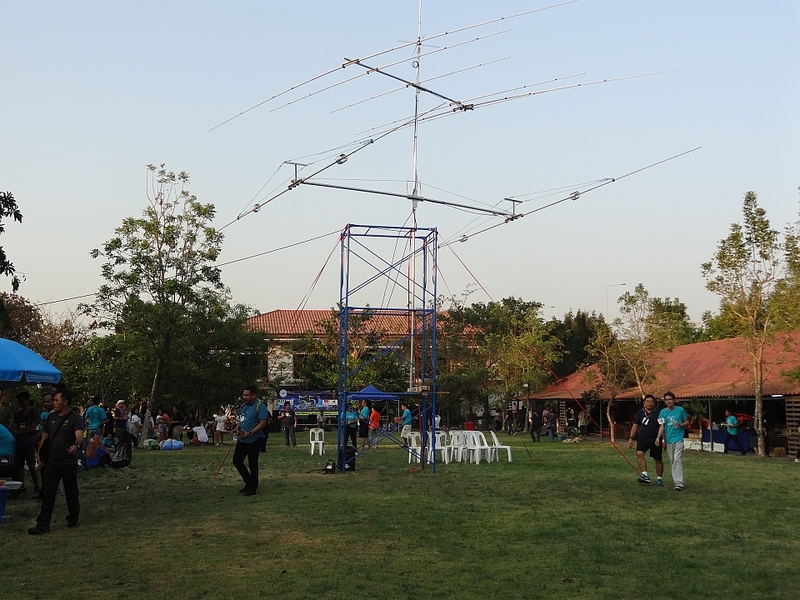 Antennas were installed in a field at Sripiamsuk Resort to enable HF activity during the party. E21FYK was one of the operators of the HS55RAST station to commemorate the event. The gathering at the resort in Pathum Thani Province just to the north of Bangkok included lunch and dinner while there was draught beer available at no charge to guests while there were lucky draws for prizes throughout the day and evening with a total of 55 radio transceivers being among the prizes that were won. An amateur radio station with HF antennas had been set up on a field at the resort and the station operated using the callsign HS55RAST. There was a wide range of equipment, both new and second-hand, on sale at the event. Solar power inverters were among the equipment on sale at discount prices at the party. 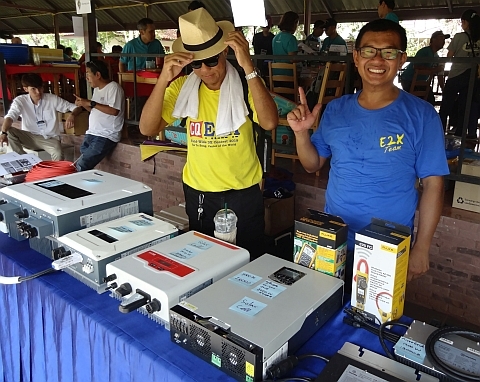 The anniversary event was also an excellent opportunity for RAST members to obtain equipment, both second-hand and new, that was on sale at various stalls around the event. There were also demonstrations of the assembly of amateur radio kits while Icom took advantage of the occasion to launch its latest IC9700 HF transceiver and had an elaborately decorated booth along with attractive YLs who posed for photographs with members and guests. During the afternoon, beginning at 13.30 after lunch, RAST also held its Annual General Meeting attended by around 100 members who were provided with the agenda (in Thai) when they registered for the meeting. The RAST 2018 AGM was held in a meeting hall at the Sripiamsuk Resort on the second floor. 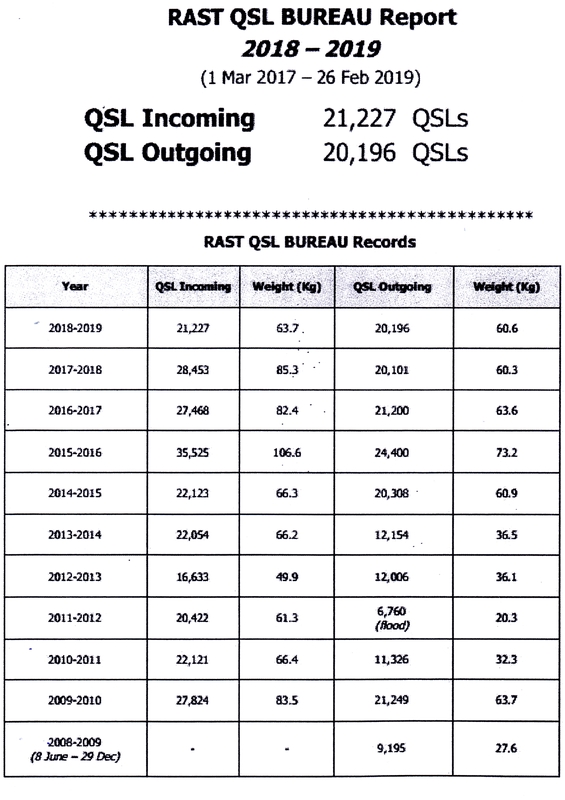 This included details about RAST's income and expenditure for the past year, the minutes of the 2017 AGM, a summary of RAST's activities during 2018 and the RAST QSL Bureau report for 2018-2019. Presiding over the meeting was Pomchanok Palakawongse na Ayudhaya, E23PKO. During the AGM meeting, RAST President HS1FVL announced that E23FXX had been appointed as a special advisor to RAST, while members present approved the minutes for the 2017 AGM held last year. Prateep Saengthammarat was also approved in a vote to be the auditor of RAST for the next 12 months and details about income and expenses, RAST's membership details were acknowledged. 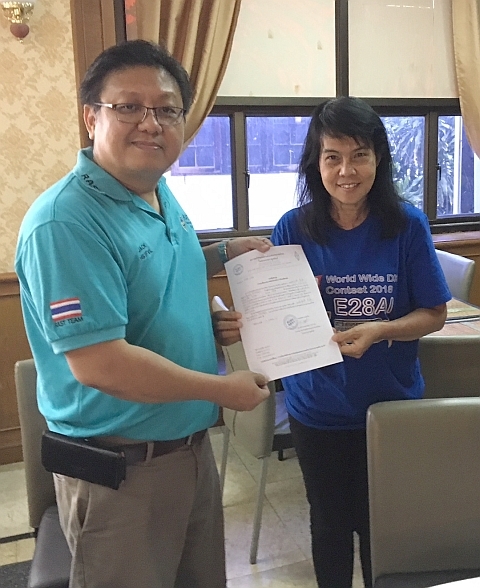 Then, E23NEZ was proposed and approved as a new committee member for technical affairs and there was a proposal that foreign members joining RAST be obliged to become Gold Members with a lifetime membership fee of 5,000 baht. 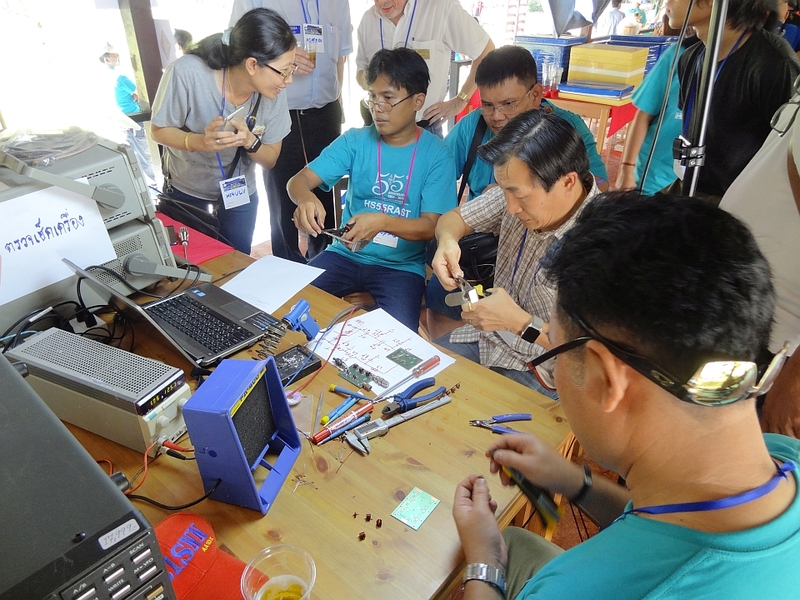 RAST President Jakkree, HS1FVL made a summary in Thai of the activities of the society in 2018, while Tony, HS0ZDX announced that an English-language version can be viewed on this website here. Then there was a proposal that the restriction on the number of consecutive terms that a president of RAST can serve, which currently limits this to two terms, be lifted. This was proposed from the floor by Joe, HS2JFW and there was some debate and a clarification that the RAST president still needs to be elected by members, while it was explained there were many issues that a RAST president needs to continue to pursue such as seeking permission for the six-metre band, the JAISAT-1 satellite project and reciprocal licensing. In the end, 88 members out of a total of 99 present voted to endorse the proposal to cancel the two-term limit for a RAST president. 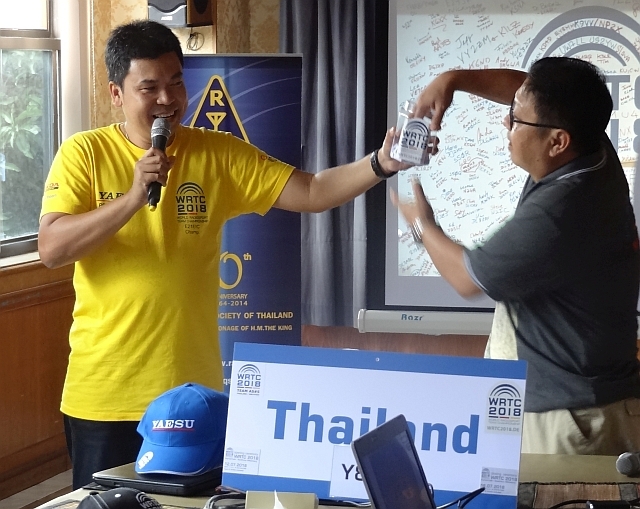 RAST President Jakkree, HS1FVL, awards a Yaesu FT-4V handheld as a lucky draw prize to E22EEO (at right). Kits were assembled during the party at a table. Following the AGM meeting which was held in the Sripiamsuk Resort's meeting hall, activities resumed outside, on the field and around its outskirts when there was an ARDF exercise while a game of musical chairs was also staged. 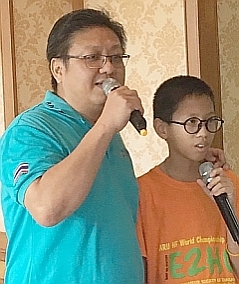 Most of the time, E23PKO, also known as Loong Nuad and pictured above at left, acted as a lively emcee and there were ongoing draws of door prizes for lucky winners. Later there was live music on the stage provided by Art, HS4LKW, followed by a few more announcements by RAST President Jakkree before the party wound up at around 22.00. 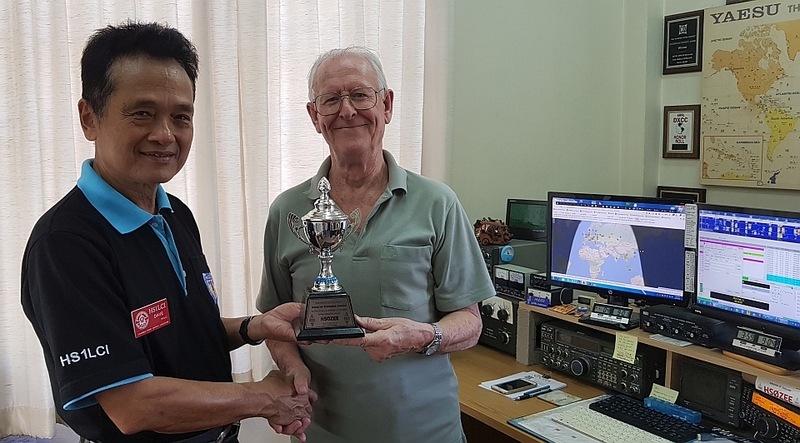 Dave, HS1LCI presents the Radio Society of Great Britain (RSGB) HF Supreme Award for working all ITU zones in five bands to RAST member Sheridon Street, HS0ZEE at his QTH in Chiang Mai. 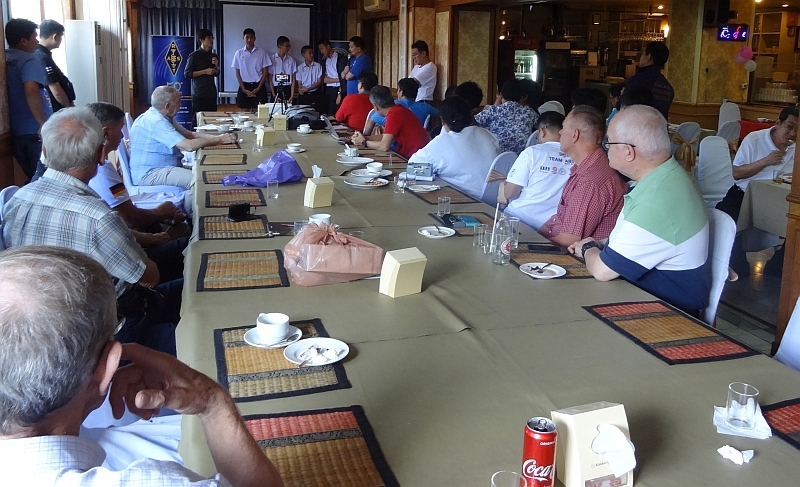 Over 40 members and guests attended the February Radio Amateur Society of Thailand under the Patronage of His Majesty the King (RAST) meeting at Sena Place Hotel in Phaholyothin Soi 11 when everyone was reminded that next month, on March 2, 2019, the society will be celebrating its 55th anniversary with a party when it will also conduct its Annual General Meeting (AGM) for 2018 at the Sripiamsuk Resort in Pathum Thani province just to the north of Bangkok. All members were invited to buy 500 baht tickets for the event which includes a buffet lunch, buffet dinner and a BBQ with free-flow drinks. There will be a total of 55 HF or VHF radios awarded to members in a lucky draw as an added incentive to attend. (Tickets will also be available on arrival). During the February meeting, RAST President Jakkree Hantongkom, HS1FVL (Jack) outlined the programme for the RAST 55th anniversary party which will take place on Saturday, March 2, being a day-long event at the Sripiamsuk Resort with registration for the party beginning at 9 a.m. Activities in the morning include a Digital Voice 101 workshop around DStar, DMR and C4FM mode, followed by an amateur radio workshop with a lecture about the building of the JAISAT 1 CubeSat satellite to be made by two key members of the JAISAT team, Tanan, HS1JAN and Apiwat, HS4SCI. This will be followed by a workshop about the measuring and tuning of radio and power supply equipment, a workshop about building HF antennas and a workshop on building a "do it yourself" duplexer for VHF/UHF. Meanwhile, leisure activites outdoors will include games to play for prizes, an amateur radio competition for HF, VHF and using digital modes with the prize being an Icom IC 2300 and ARDF activities on two metres and in the 80 metre band. There will also be a panel discussion entitled "What has happened in amateur radio over the past 55 years" conducted by Loong Nuad, E23PKO along with invited guests. In addition, during the event there will be equipment on sale at special prices from the dealers of major brandname amateur radio products while there will also be an opportunity for guests to buy and sell old amateur radio equipment they may possess. At the February meeting Jack asked everyone to bring any old or unused equipment they would like to sell to the party. There will also be an opportunity for guests to apply to join RAST during the party. From noon on March 2 lunch will be available and this will be followed at 14.00 by the society's Annual General Meeting for 2018. The agenda for the AGM can be found as summarized in the formal invitation in Thai sent out to all RAST members. The agenda includes the approval of the minutes of the 2017 AGM, a summary of activities and achievements by the society during 2018 (outlined in Thai at the link above), the appointment of an auditor for the society in 2019, a report on the society's assets, income and expenses for 2018, a report on membership of the society and there will be the opportunity to vote on any modifications to the society's regulations, should this be proposed. Following the formal AGM the party will continue all day on March 2 until 9 p.m. in the evening with a BBQ and buffet food being available while there will be a total of 55 radios awarded as prizes, including top of the line models of HF and VHF equipment to guests such as the Icom IC 7300 transceiver, the Icom G88T handheld and the Yaesu FT-4V handheld. 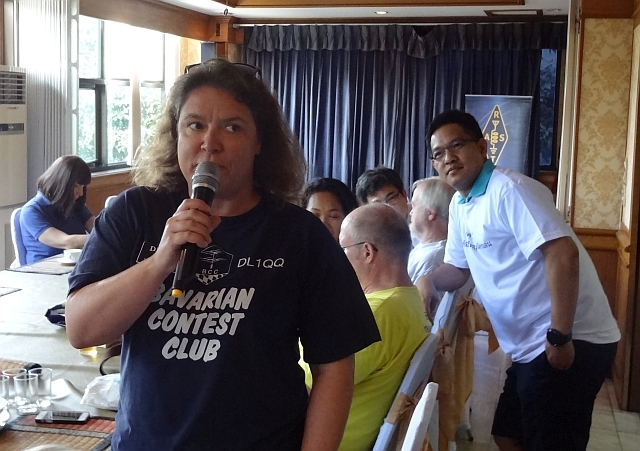 During the February meeting, the RAST President also announced that the next VEC examination for a US FCC licence would take place on March 16 in Lard Krabang while he also announced that from February 26 to March 9, RAST Secretary Champ, E21EIC would be on a DXpedition to Bhutan (A5). The other announcement he made was about six metres in that this year the military had opposed a request for amateur radio stations to operate in the band during the CQWW VHF Contest although he said that RAST was lobbying strongly for a permanent allocation in the six metre band from 50.00 MHz to 50.04 MHz and that he would keep members informed of developments. The 55 Anniverary Party will effectively be the March RAST meeting and there will be no get-together on Sunday, March 3 at Sena Place Hotel. 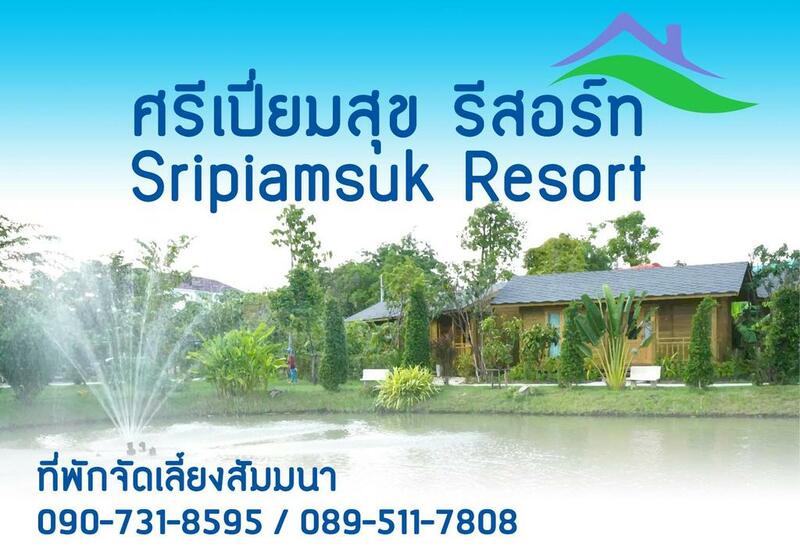 A view of Sripiamsuk Resort. Here is a summary of the directions from downtown Bangkok: Take the Sirat Expressway that heads north from Bangkok (on the Expressway simply follow the signs for Chaeng Wattana -- but don't get off there) and, after the Chaeng Wattana exit, continue on the Expressway, following the signs to Thammasat University - Rangsit Campus. Around four and a half kilometres after the exit for Chaeng Wattana Road you will reach the exit for Si Saman Road. Leave the Expressway here and then follow the sign for Don Mueang which will take you over Si Saman Road in a loop that will lead you onto Si Saman Road (also known as the Prachachuen-Pakkred Road) heading east. Proceed under the Expressway (towards Don Mueang) for half a kilometre to the first major intersection with traffic lights where you turn left into Liap Klong Prapa Road (the road sign says Rangsit). 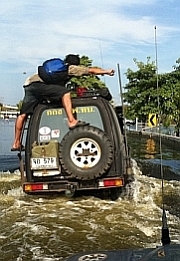 This is the road next to a canal (klong). Head north along the Liap Klong Prapa Road (keeping the canal on your right-hand side) for 2.3 Km and then turn left. Follow this road west for 350 metres (which takes you back towards the Expressway) to join the road that is underneath the Expressway. Turn left and follow this road under the Expressway for 550 metres and the road ends in front of the resort. 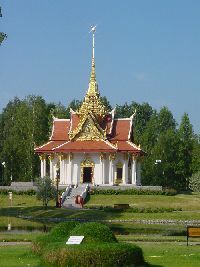 Turn right and you will have entered the Sripiamsuk Resort. 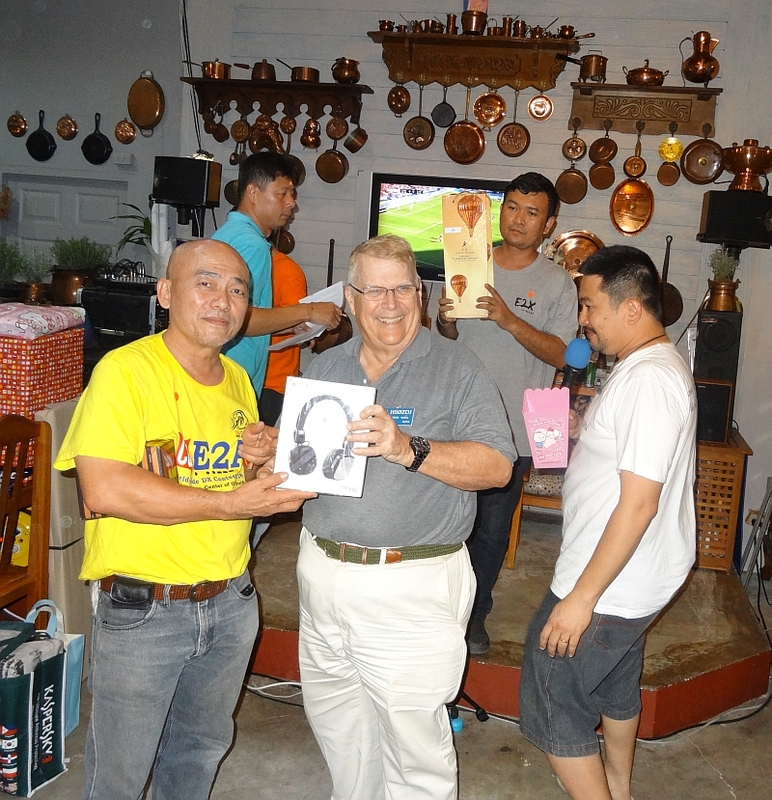 The Radio Amateur Society of Thailand under Patronage of His Majesty the King (RAST)'s New Year Party at the Rot Meu Mae restaurant in Laksi on Sunday, January 13, 2019 was well attended with over 70 members and guests taking part. Outside the restaurant there were various activities, including the assembly of electronic circuits (as can be seen below) and a satellite station (the antenna is featured in the picture below) that worked stations using the LAPAN A2 satellite, while inside the dining hall there were volunteer singers who entertained those present from around 2 p.m. onwards until there was a lucky draw for gifts from RAST along with an exchange of gifts brought by many guests in a draw. 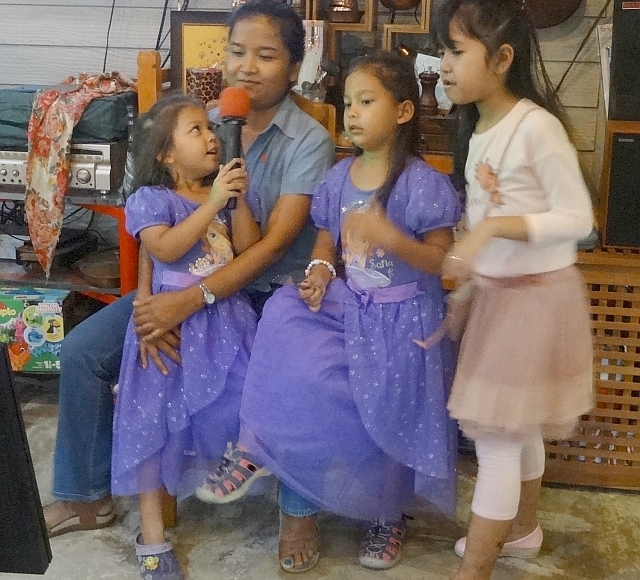 From around 5 p.m. onwards a good buffet dinner with a wide variety of spicy Thai dishes was available while soft drinks and beer were on hand all afternoon and evening with an ample supply of chilled beer cans thanks to donations from several members. 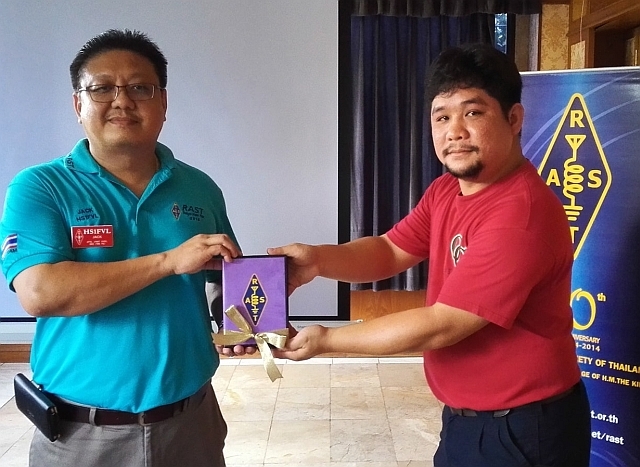 RAST President Jakkree (Jack), HS1FVL (pictured above holding the microphone) also announced that the society will be holding its 55th Anniversary Party on March 2 at the Sripiamsuk Resort in Pathum Thani province just to the north of Bangkok. Tickets were also on sale for 500 baht during the meeting. The event will take place from 9 a.m. until 9 p.m. and accommodation is available for guests who would like to stay overnight. Prior to that there will be the next monthly meeting of RAST on Sunday, February 3, 2019 at Sena Place Hotel as usual. Hopefully, these photographs capture the atmosphere at the RAST New Year Party. The satellite antenna is in the foreground while kits are being assembled in the background during the afternoon. 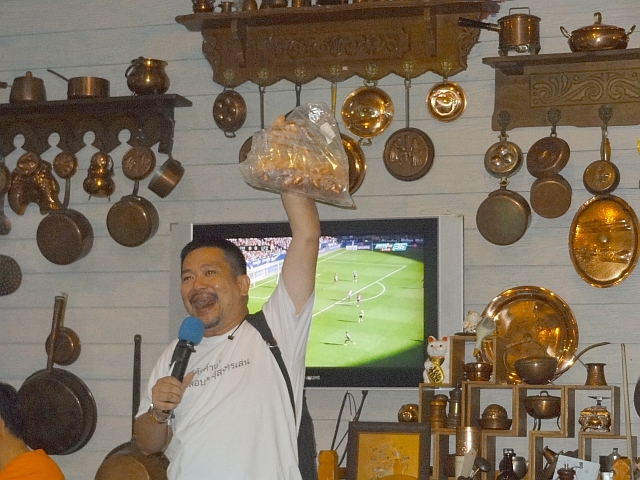 Pomchanok, E23PKO displays prizes that were to be awarded in the RAST lucky draw. John, HS0ZDJ holds up a pair of headphones he won in the lucky draw. Sam, HS0ZDY receives his lucky draw prize. Tony, HS0ZDX received his RAST lucky draw prize of a Diamond Antenna SWR & Power meter from Champ, E21EIC, the secretary of RAST. A view of the booth showing some of the late King Bhumibol Adulyadej's amateur radio equipment. 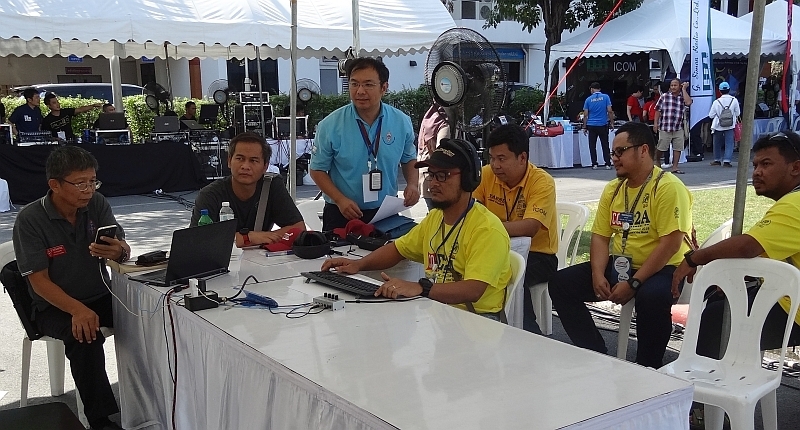 Thailand's regulator, the National Broadcasting and Telecommunications Commission (NBTC) hosted the fourth annual Amateur Radio Day on its grounds at the NBTC Secretariat on Phaholyothin Soi 8 on Saturday, December 15 which was well attended and which saw amateur radio associations from all regions of the country participating. The theme of the event was Innovation in Amateur Radio and in the morning there were seminars while all day there were tents which served as exhibition booths where societies were able to promote their activities and also compete for prizes from a team of judges who spent over two hours visiting each booth and listening to what the exhibitors had to say about their role in innovation. Nukool, HS7BHK explains RAST's role in innovation to the team of judges during the event. 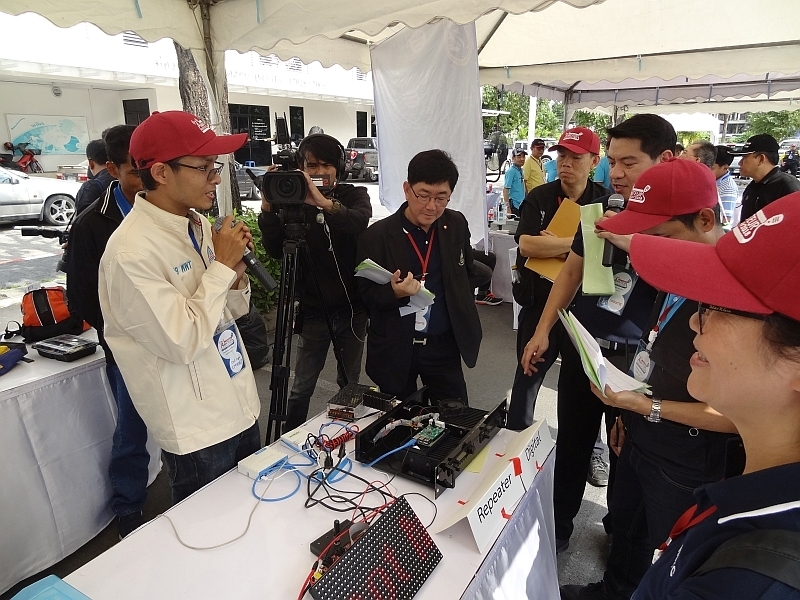 A Surat Thani Amateur Radio Association representative talks to the judges as they visit his booth. There was also a booth that commemorated His late Majesty King Bhumibol Adulyadej, HS1A-SK and which displayed some of his amateur radio equipment. 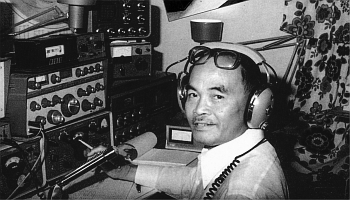 The late King Rama 9 had been a pioneer in amateur radio in Thailand and had been an inspiration for Thais to take up the hobby. 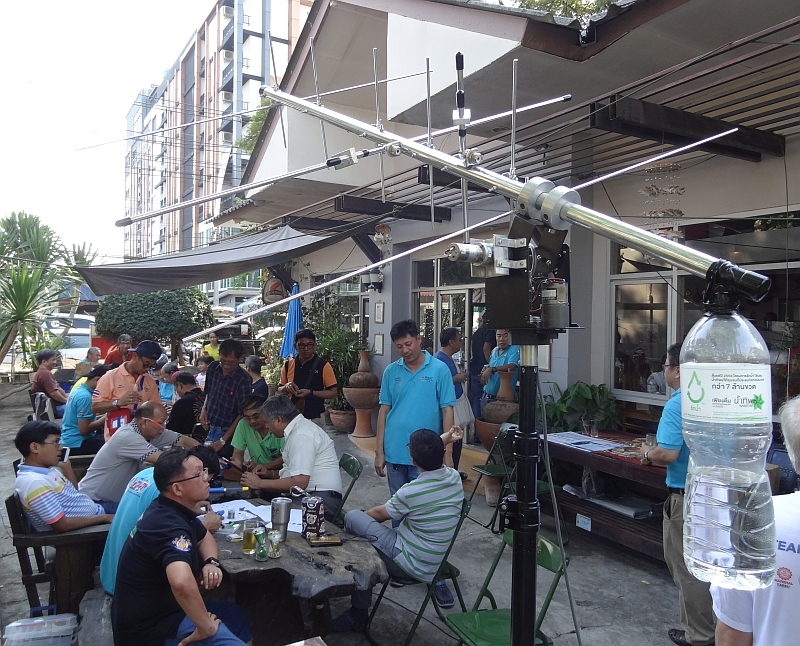 There were also booths promoting DStar and Icom also had a booth while RAST took advantage of the opportunity to demonstrate HF operating using the callsign HS18NBTC as well as satellite communications using the LAPAN-A2 (IO-86) Indonesian satellite. The RAST booth also had a team of YLs. 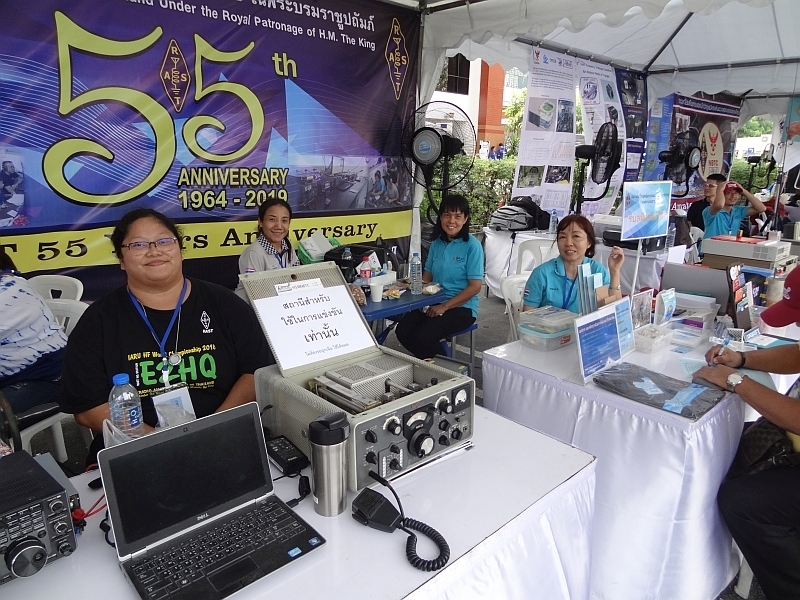 Other amateur radio societies with booths included the Voluntary Radio Association (VRA) and the amateur radio societies of Chon Buri, Chachoengsao, Nakhon Ratchasima, Si Sa Ket, Udon Thani, Pathum Thani, Chiang Mai, Lampang, Lamphun, Phitsanulok, Phetchabun, Surat Thani, Narathiwat and Songkhla provinces. During the afternoon there was an amateur radio direction finding competition while there was also a CW listening contest with the code being sent at speeds of 10, 20 and 30 wpm, where Champ, E21EIC came first in the 30 wpm category. The booth where the CW listening competition was held during Amateur Radio Day, Champ can be seen at the rear, third from the right. 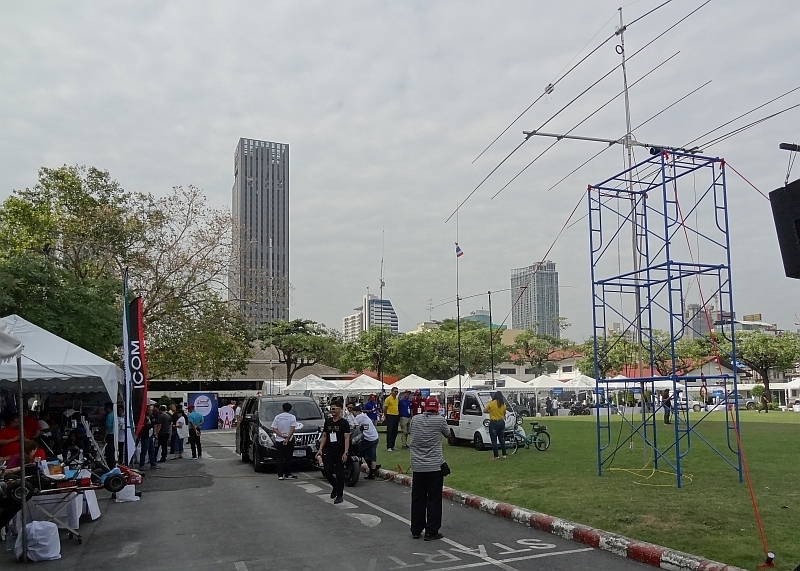 There were also mobile emergency communications vehicles on display while temporary HF, VHF and satellite antennas had been erected on the grounds of the NBTC Secretariat. 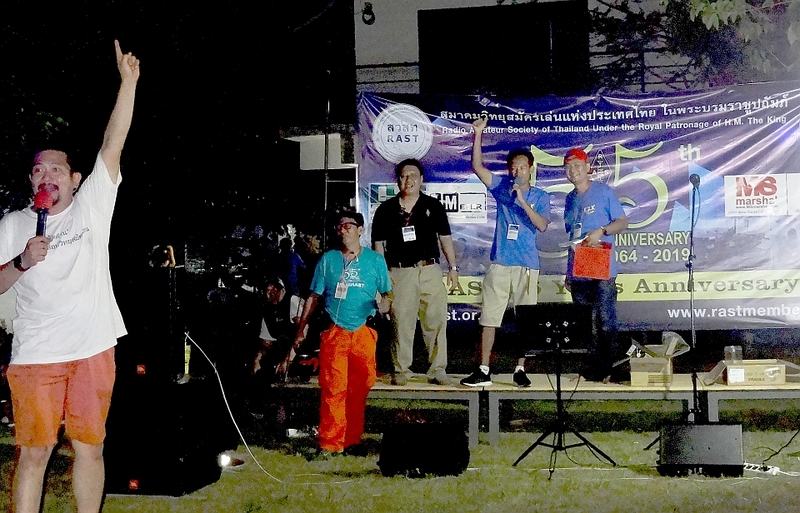 During the evening, awards were announced and plaques and trophies were presented by NBTC officials to the winners. 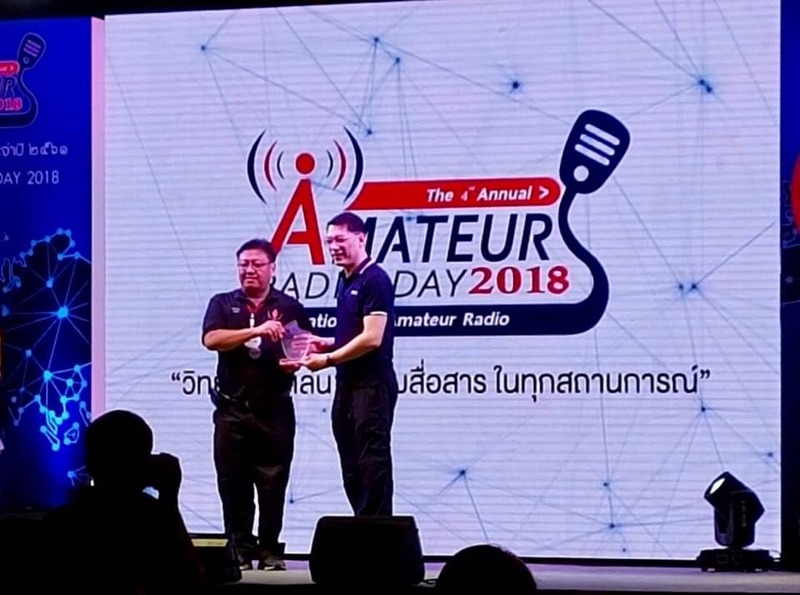 RAST won the "Amateur Radio Organization Award" for overseeing amateur radio in Thailand as well as for international activities in 2018 and the Deputy Secretary General of the NBTC Korkij Danchaivichit presented the award on the stage. RAST President Jakkree receives the trophy on behalf of RAST for being the leading Amateur Radio Organization. RAST President Jakkree presents a plaque to Nimit, HS1IFU for gaining an honorable mention for innovation in technology development. 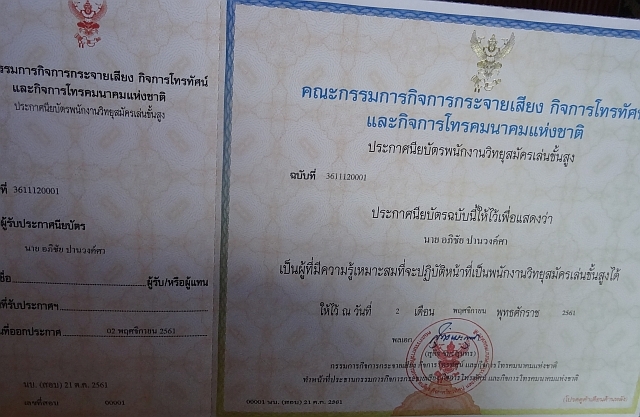 Other recipients of innovation awards were Nukool, HS7BHK, who won the first prize for innovation in communication technology, Pakorn, HS1EFA for innovation in emergency communications and Nimit, HS1IFU received an honorable mention for innovation in technology development while also winning the popular vote for an electronic go-kart. 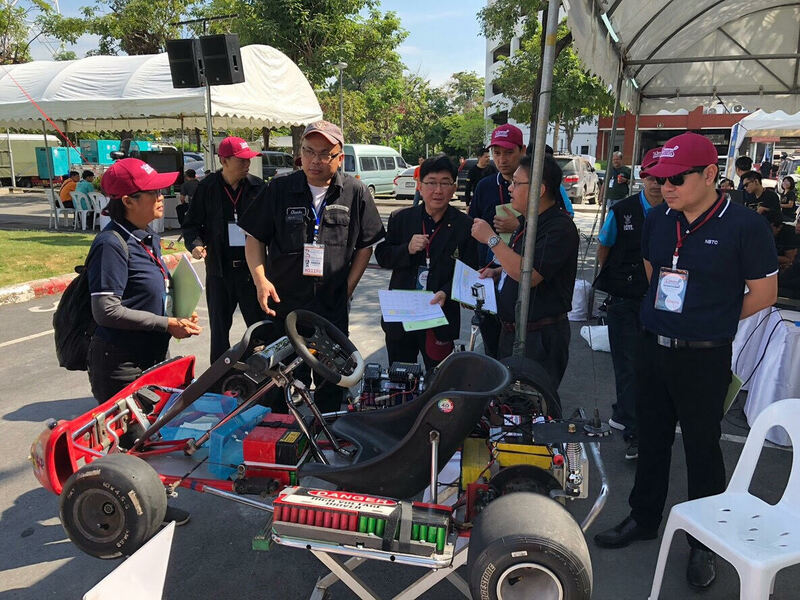 Nimit, HS1IFU also won the Popular Vote for the electronic go-kart and he is pictured here explaining the features to the judges. 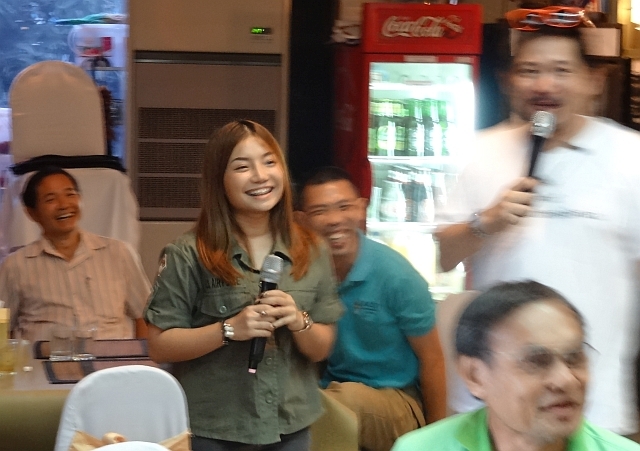 Pomchanok, E23PKO (with the microphone at left) during introductions of recipients of the Advanced Class certificate during the December, 2018 meeting. Those who passed the Advanced Class Amateur Radio Examination in October line up to receive their certificates. 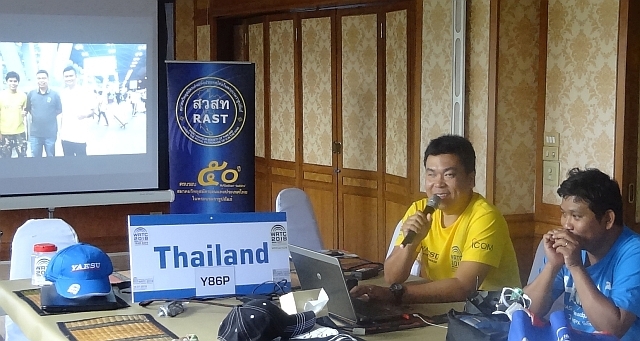 The December meeting of RAST at Sena Place Hotel was very well attended with over 60 members and guests present, including more than 20 Thai radio amateurs who had just passed the Advanced Class amateur radio examination that had been overseen by RAST on October 21 at Rajapreuk University. 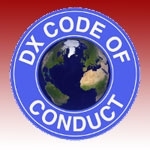 There were also many expatriate licensed amateur radio operators who were invited to introduce themselves as "new faces" or returnees to a RAST meeting and these included VK4AYL, Bambi, HS0ZNE, Bengt, HS0ZLN, Renato, HS0ZNV, Horst, HS0ZGC, Richard, HS0ZNN, who is resident in Ko Lanta, HS0ZKW, Paul, HS0ZNW, Sandy (pictured above), HS6SSE, Benjamas and HS0ZET, Ralf. RAST President Jakkree (Jack), HS1FVL began his announcements after the introductions which followed the buffet lunch by reminding everyone that on Saturday, December 15 the Thai regulator, the National Broadcasting and Telecommunications Commission (NBTC), will be hosting Amateur Radio Day at its grounds on Soi Sailom, Phaholyothin Soi 8. 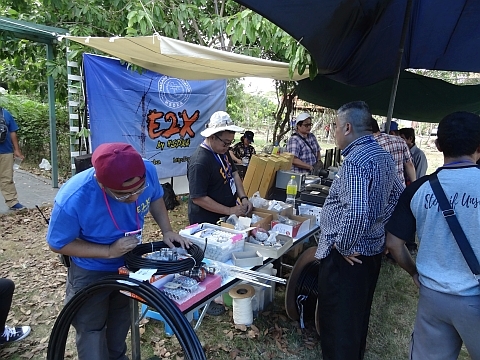 The day-long event, which begins at 9 a.m. in the morning, comprises seminars and an exhibition area and RAST along with other amateur radio societies in Thailand will be participating. RAST will have tents on the premises where HF and VHF amateur stations will be operating and the society will also have an ARDF tent, a "homebrew" tent and a satellite tent while an International Amateur Radio Union (IARU) tent which will also be hosted by RAST. Food will be available and there will also be a dinner served in the evening and all members and any radio hams visiting Thailand on Saturday, December 15 are welcome to attend. At the meeting, members were also reminded that RAST will be hosting its New Year party on January 13, 2019 which is in lieu of its regular meeting that month. As for the past few years, the RAST New Year Party will be held from 3 p.m. onwards at Rot Meu Mae, a restaurant near the North Park Golf Course in Laksi, northern Bangkok. For a map, please click on this link. As was the case last year, there will be a buffet with free-flow refreshments for 500 baht. Directions: Head north from Bangkok along Vibhavadi Rangsit Highway and after the Ngarmwongwarn Road intersection take the frontage road. Turn left into the road signposted "North Park" (2.25 km beyond Ngarmwongwarn intersection). Follow this road for one and a half kilometers to a roundabout. Exit left and after 100 metres the Rot Meu Mae restaurant will be on your right. Those attending should bring a gift-wrapped present valued at 500 baht or more for exchange during the party. 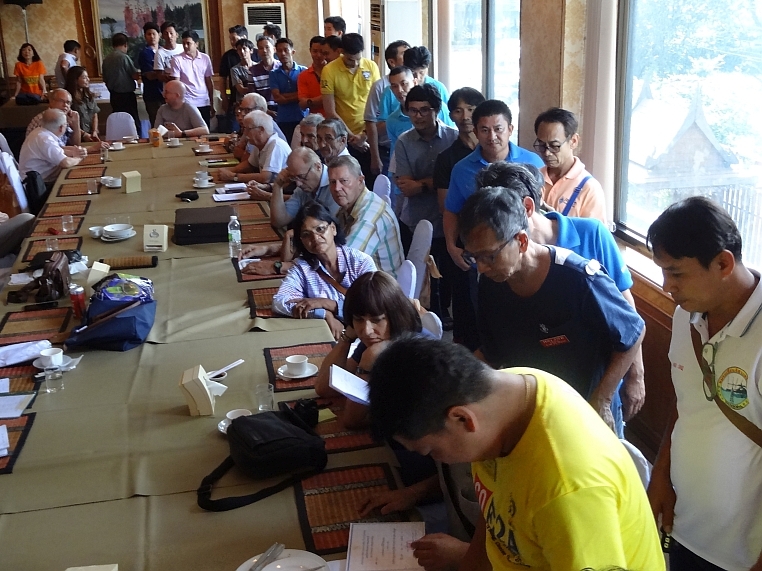 Then, those who had passed the recent Advanced Class amateur radio examination who were present at the meeting were invited to receive their NBTC certificate attesting to this and, after lining up, they proceeded forward to receive the document from Jack, while RAST Secretary Champ and RAST Registrar J.C. Goi assisted. Congratulations to all who passed! Later, during the December meeting, Jack announced the revised date for the annual ARDF Championships which will now take place near Hua Hin on February 16-17, 2019. 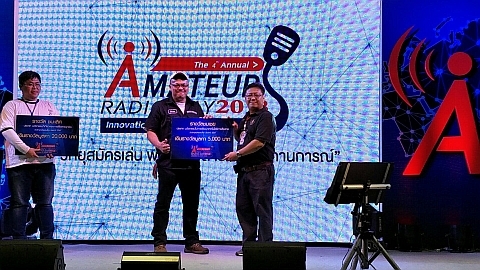 This was postponed from the original date of December 15 as had been announced earlier because otherwise the event would have clashed with the NBTC's Amateur Radio Day. 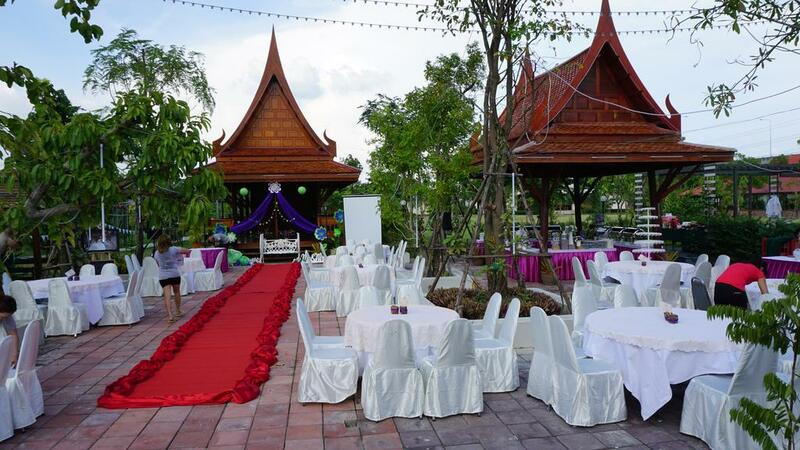 The other major upcoming event that those present were informed about is the 55th anniversary party of RAST, along with the AGM for the year 2018, which is to be held at the Sripiamsuk Resort in Pathum Thani just to the north of Bangkok. This will be held on March 2, 2019 and in the morning there will be an FCC VEC examination there. There will be a barbeque, a buffet lunch and free-flow drinks for a package price of 500 baht. In the meantime, RAST has received permission to operate its club station with the special event callsign HS55RAST leading up to the event. 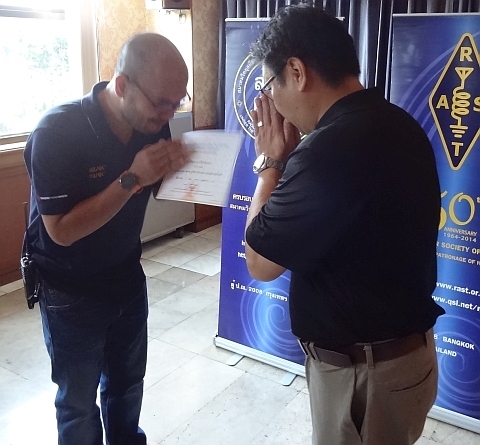 Above, RAST Secretary Champ, E21EIC organizes the certificates for the recipients of Advanced Class Certificates who stand in line by the window at the Sena Place Hotel restaurant and will receive them from RAST President Jakkree (Jack). 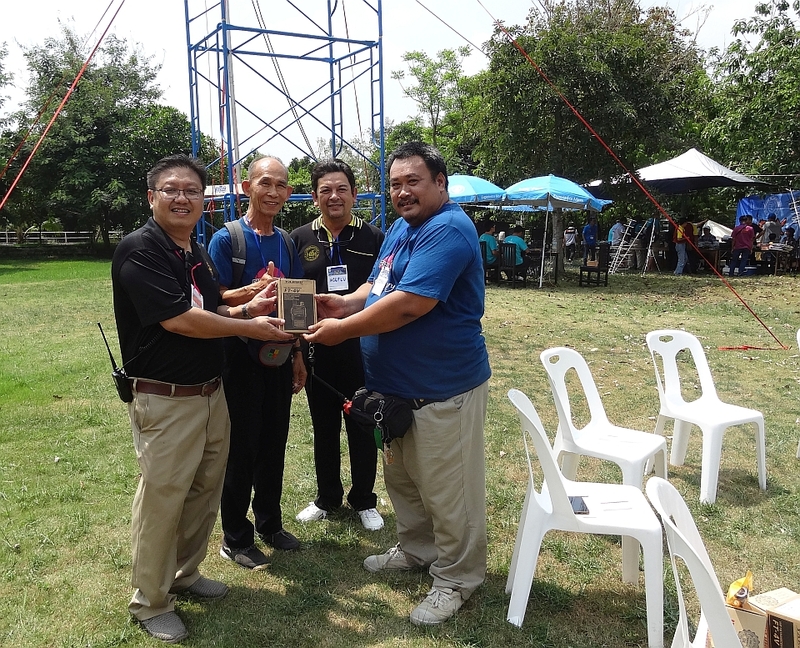 RAST President Jakkree, HS1FVL (right) offers to help Bangkok Christian College students to ensure that their equipment and ground station is properly licensed by the authorities. 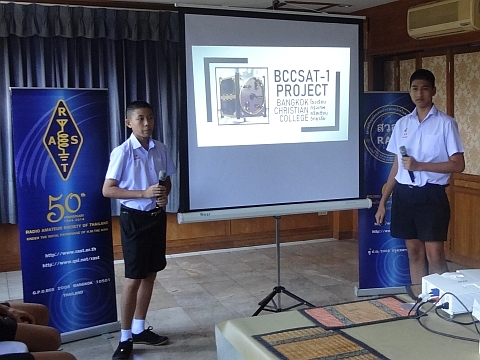 The highlight of the RAST monthly get-together at Sena Place Hotel in November was a presentation about a project to launch a Cubesat satellite by high school students of Bangkok Christian College (BCC) in conjunction with King Mongkut's University of Technology North Bangkok (KMUTNB). 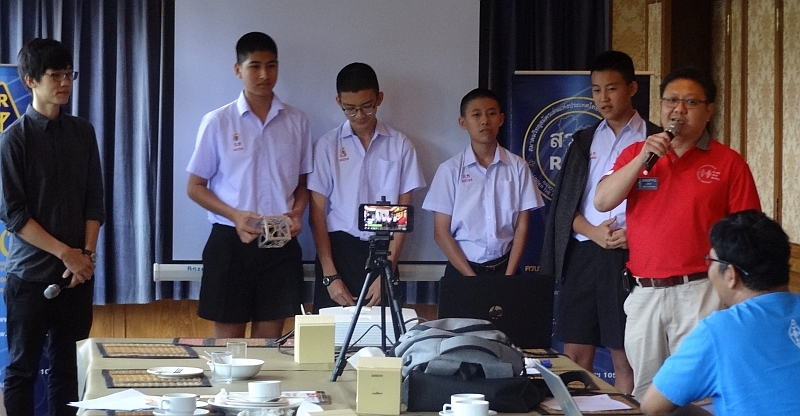 Following the buffet lunch, students from BCC took the microphones and, with the help of images projected on a screen, explained the school's space project which is to launch a 1U Cubeset by the end of 2019 or in early 2020 with four different cameras (Optical, Short Wave Infrared (SWIR), Near Infrared (NIR) and Red. The ground station, which will use amateur radio frequencies, will be located in the grounds of the college on Sathorn Road where the roof of the building has an uninterrupted view of the sky. The satellite itself is being built in Thailand, but with some of the components being imported. The launch is planned to be in about one year's time, or slightly longer than that, using a Russian Soyuz rocket. RAST President Jakkree, HS1FVL thanked the students for their presentation, which was made both in Thai and in English, and he said that RAST would help the college where it could, and particularly for getting licences for the ground station and for radio transmitting equipment from the National Broadcasting and Telecommunications Commission (NBTC) and help ensure that everything was legal and in order. There is a TV channel 7 video about the project while additional information can be found here. There is also a good article in Thai in Thai Post here. Following the satellite presentation, RAST President Jakkree made some announcements, including a planned Open House at Rajapreuk University where RAST has its HS0AC club station on November 15 where there will be a seminar in the morning, beginning at 9 a.m., and followed by a lunch. 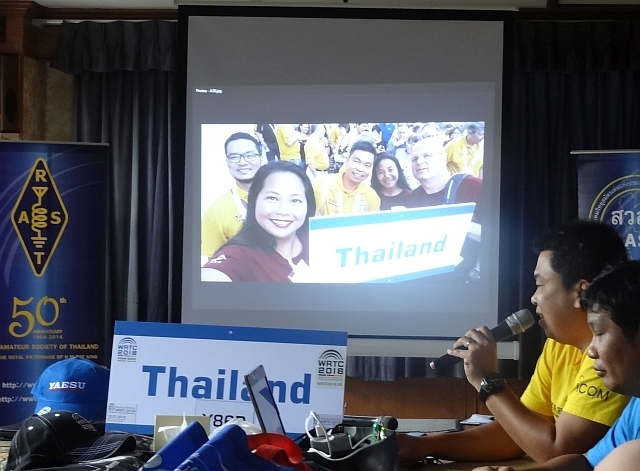 Jakkree (Jack) also announced that the NBTC would be hosting its Amateur Radio Day exhibition in its grounds on Soi Sailom, Phaholyothin Soi 8, on Saturday, December 15. RAST will have tents at the event and will be operating on various frequency bands there and all members are encouraged to attend. As a result, plans to host the ARDF Championships which had been scheduled for December 15, have been postponed and the event will take place either later in December or early next year. The location should be in the Hua Hin area and details will be announced later. And to mark the beginning of 2019, RAST will host a New Year party on the second Sunday of January, January 13, at the Rot Meu Mae restaurant, which is the same location for the party as last year, and which not far from Laksi to the north of Bangkok. 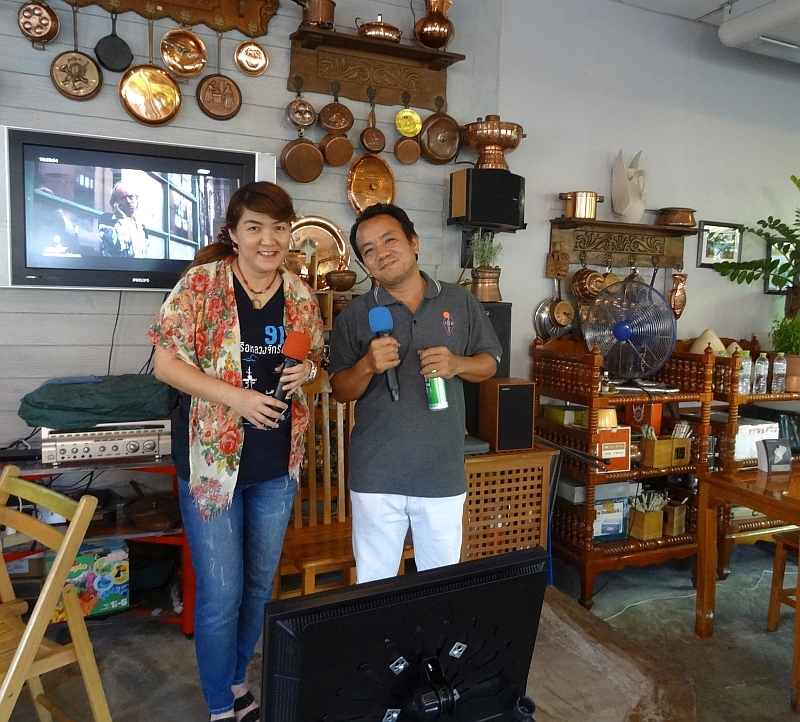 The party will begin at 3 p.m. and there will be a buffet with food and refreshments for 500 baht. This will also double as the January RAST meeting, so there will be no gathering on the first Sunday of the year. 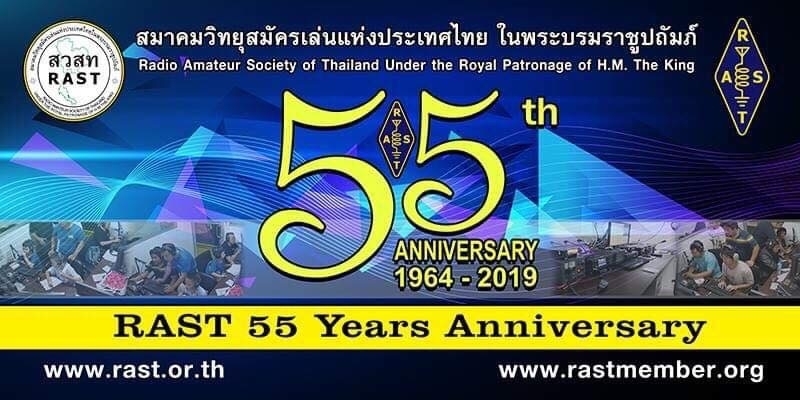 The other major forthcoming event on RAST's calendar will be its 55th anniversary meeting on March 2 which will take place at the Sripiamsuk Resort in Pathum Thani to the north of Bangkok on the Chao Phya River. The event will begin at 10 a.m. and will also incorporate the society's Annual General Meeting. This will be a day-long event and members can stay at the resort overnight if they wish. The next RAST meeting will take place on Sunday, December 2 at Sena Place Hotel while among those introducing themselves as either newcomers or returnees at the November meeting were Franz, DJ9ZB and HS0ZLP, Peter, HS0ZGM from Nan, Horst, HS0ZNV from Koh Lanta, Jakrapot, HS1ERP, Ken, VE3HLS and Uwe from Germany. There is also a 65-minute video of the presentations and announcements on Facebook at this link. 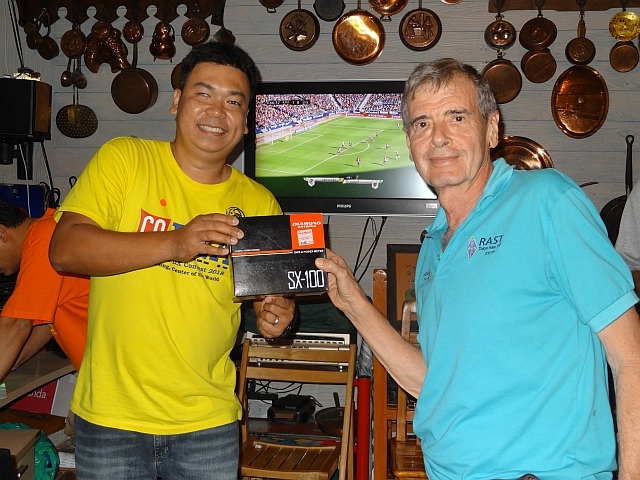 The October RAST meeting at Sena Place Hotel was well attended, with several new faces who introduced themselves at the beginning of the meeting, including Carl, G4VFU who is resident in Nong Khai, Horst, DJ9ZX/HS0ZNV and Kent, SM5ELV. Following the buffet lunch, RAST President Jakkree Hantongkom, HS1FVL (Jack) began his announcements by saying that next year RAST will celebrate its 55th anniversary on the first Sunday of March (March 3, 2019) when the society will host an anniversary party as well as conducting its Annual General Meeting for 2018. The event will take place at a restaurant on the bank of the Chao Phya River in Nonthaburi, just to the north of Bangkok. Jack also announced that RAST has appointed a committee to supervise and oversee the upcoming Advanced Class Examination which will take place on October 21 at Rajapruek University in Nonthaburi. 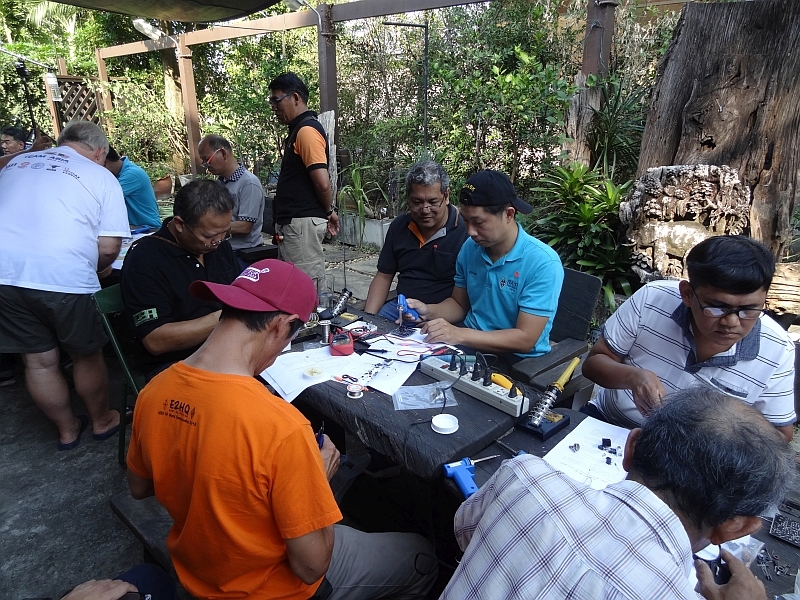 Later this month, the annual SEANET Convention will take place in Yogjakarta, Indonesia where it will be hosted by Indonesia's national amateur radio society, ORARI, from October 18-21. However, the location of the convention for the following year, 2019, has not yet been determined and so RAST has submitted a proposal to host the SEANET Convention next year in Phuket. This will be voted on during the upcoming convention and the outcome will be known later this month. Jack also told those present at the meeting that RAST Vice President Ukrit, HS1AXC will be responsible for organizing the ARDF Championships and awarding the RAST ARDF trophy. 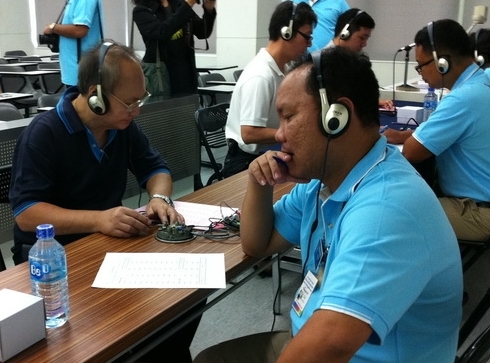 The competition which will feature teams from amateur radio societies throughout Thailand will take place on the weekend of December 15-16 with the location being very close to Ratchaphat Park in Hua Hin in the province of Prachuap Khiri Khan. 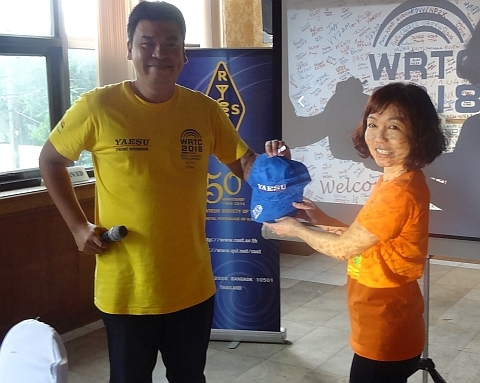 Meanwhile, during the International Amateur Radio Union (IARU) Region 3 Conference held during September in Seoul, Korea, RAST President Jakkree, HS1FVL was elected to become an IARU Region 3 Director and those present also voted to approve a proposal by RAST to host the next IARU Region 3 Conference which will take place in 2021 in Bangkok. At left: Jack with Bhoom, E24RVK/KI7PGH who is 13 years old and who upgraded to a US General Class licence at the FCC exam on September 22, while at right Jack presents a certificate to HS5BQT/KG5ULY who upgraded to a US Extra Class licence. During the October meeting, those who were successful in upgrading their licence class by taking an FCC VEC exam conducted by Champ, E21EIC and a team of VEC examiners on September 22 received certificates from Jack, and they included HS5BQT/KG5ULY and HS5XWY/KC1JPW who both upgraded to Extra Class, E24VRK/KI7PGH, who is now 13 years old, HS2AQG/KI7WRG and E25ABK/KI7WRF who all upgraded to General Class licences. 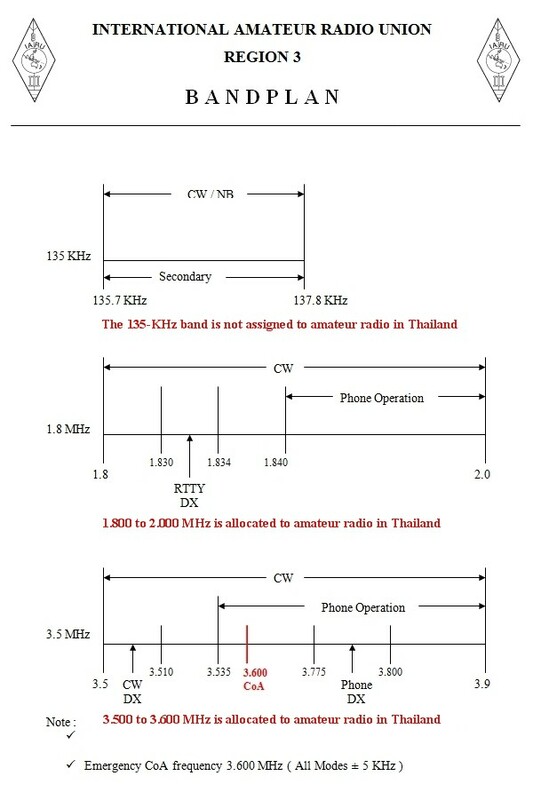 The Thai regulator, the National Broadcasting and Telecommunications Commission (NBTC), regards Thai radio amateurs who hold FCC licences as Intermediate or Advanced Class amateur radio operators in Thailand. -- With thanks to Champ, E21EIC for this report and the accompanying photographs. 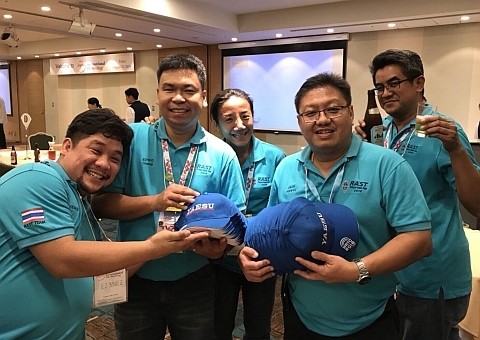 The RAST delegation: from left, RAST Registrar Acting 2nd Lt Neeranuch Muangamphan (JC Goi), E20NKB, RAST Secretary Chalermphol Muangamphan (Champ), E21EIC, RAST President Jakkree Hantongkom (Jack), HS1FVL, RAST member Krisada Arjinpattara, E21FYK, and RAST Committee member and Emergency Communications Co-ordinator Apinant Kaeo-yu (Pop), HS1JZT. 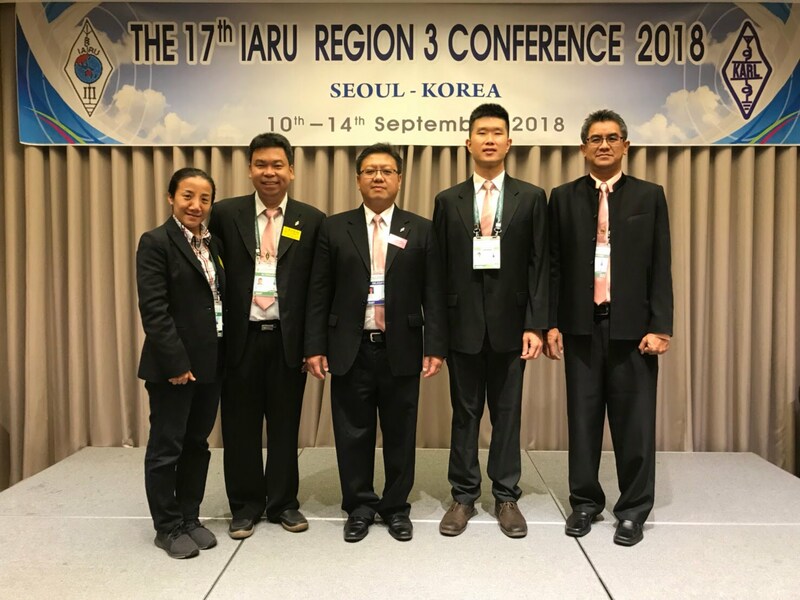 The IARU Region 3 Conference in Seoul, Korea from September 10-14 was attended by a delegation of five RAST members, led by RAST President Jakkree Hantongkom (Jack), HS1FVL and accompanied by the RAST Secretary, Chalermphol Muangamphan (Champ), E21EIC, RAST Registrar Acting 2nd Lt Neeranuch Muangamphan (JC Goi) E20NKB, RAST Committee member and Emergency Communications Co-ordinator Apinant Kaeo-yu (Pop), HS1JZT and RAST member Krisada Arjinpattara, E21FYK. During the conference, RAST proposed to host the next triennial conference that will take place in the year 2021 and this was approved in a vote. In addition, RAST President Jakkree was nominated as an IARU Region 3 director and this was also endorsed by those present. We will bring you a full summary of the conference later on this website, and at the October 7 RAST meeting at Sena Place Hotel there should also be a report from those who participated in the event. The RAST delegation is seen here with the president, vice president and directors of the IARU, with IARU Region 3 Director Gopal Madhavan, VU2GMN, at the centre of the picture. To his right in the picture is IARU President Tim Ellam, VE6SH, IARU Seretary David Sumner, K1ZZ and IARU Vice Pesident Ole Garpestad, LA2RR. The RAST delegation to the Tokyo Ham Fair lines up at Tokyo Big Sight for a group photograph. The September RAST meeting at Sena Place Hotel on September 2, 2018 was well attended with around 50 members and guests present, including several new faces. 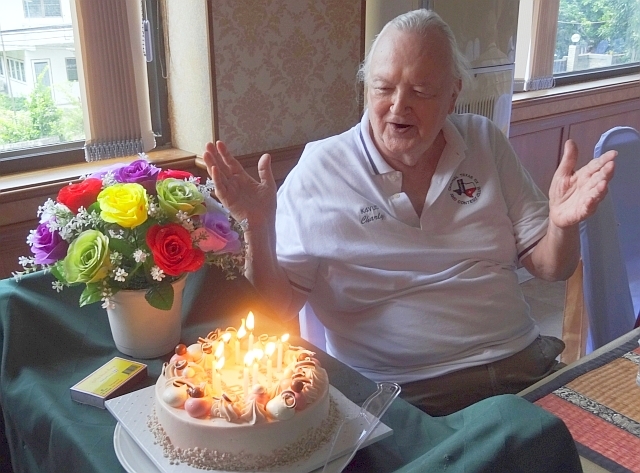 The formal part of the meeting, after the buffet lunch, began with a surprise birthday cake for Charly, HS0ZCW who was celebrating his birthday. The cake, which had been sent to the event by his XYL, was presented with nine candles flickering as those present at the meeting sang the "Happy Birthday" song. Charly was all smiles as the staff cut the cake into slices to help him share it with others in the room. 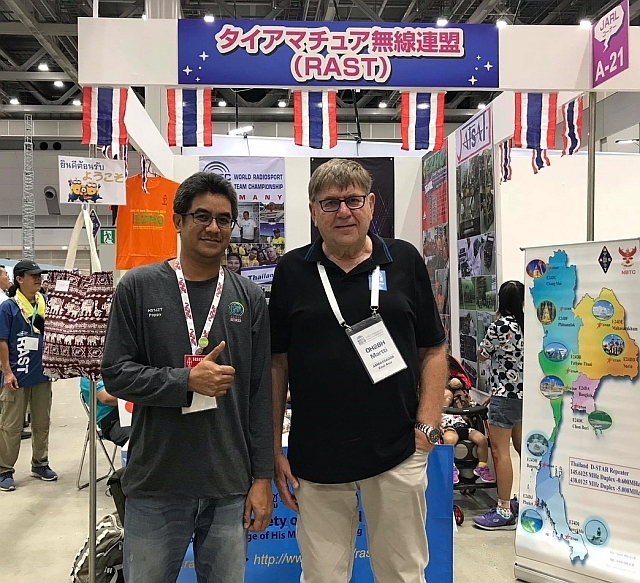 RAST President Jakkree (Jack) began by saying that RAST's participation in the Tokyo Ham Fair the previous weekend had been a success, where RAST had a booth with over a dozen RAST officers and members taking part. 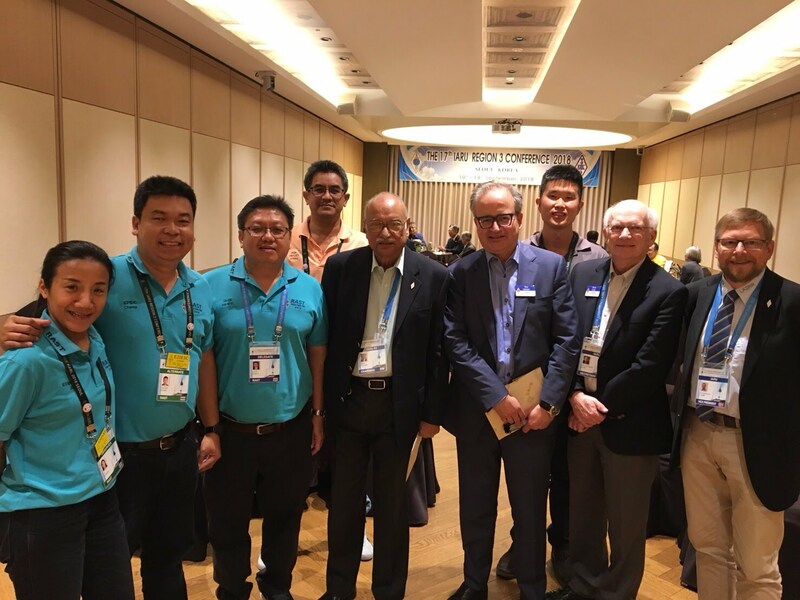 Jack then said that the next major item on the agenda would be the 17th IARU Region 3 Conference scheduled to take place on September 10-14 in Seoul, Korea when he along with four other RAST delegates would be participating. At left, Pop, HS1JZT, and Martti Laine, OH2BH, in front of the RAST booth. The RAST President revealed that RAST would be seeking support from representatives of other amateur radio societies at the meeting for a request to be submitted to the National Broadcasting and Telecommunications Commission (NBTC) to seek permission for licensed amateur radio operators in other Asian nations to be permitted to operate here for up to three months with a temporary callsign HS0/homecall RAST would also be looking for support at the IARU conference from other societies to endorse an appeal for a 400 KHz allocation on the six metre band, from 50.000 to 50.400 MHz. While in Seoul, Jack said he also hoped to have the opportunity to propose to the Organisasi Amatir Radio Indonesia (ORARI) that RAST would like to host the 47th Southeast Asia Net (SEANET) Convention next year in Phuket. This year, ORARI is hosting the convention in Jogjakarta from October 18-21. 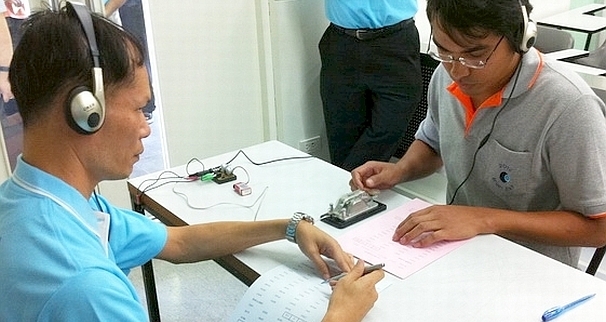 In addition, the next Advanced Class amateur radio examination in Thailand will take place on October 21, 2018 for which a total of 122 candidates have registered, while the next FCC VEC examination will be conducted at noon at the KMIT North Bangkok campus on September 22. The next RAST meeting will be on Sunday, October 7. These Yaezu caps were received at the Tokyo Ham Fair and were distributed to RAST members at the September meeting in Bangkok. The highlight of the August RAST monthly get-together at Sena Place Hotel on Sunday, August 5 was an account by RAST Secretary Champ, E21EIC of his trip to Germany to participate in the World Radiosport Team Championship 2018 last month. He was invited to speak following announcements by RAST President Jakkree (Jack), HS1FVL, which included mention of upcoming trips to the Tokyo Ham Fair later this month where RAST will have a booth and participation in the IARU Region 3 Conference in September (Sept 10-14) in South Korea. Jack will lead delegations to both events, accompanied by RAST Secretary Champ, RAST Registrar JC Goi, E20NKB and RAST Committee member Apinant (Pop), HS1JZT. Jakkree also mentioned that RAST intends to celebrate its 55th anniversary at the end of next February with a dinner party at a riverside restaurant or resort in Bangkok, the location of which has yet to be decided upon. On the projector screen Benjamas, HS6SSE holds the "Thailand" sign with Ralf, HS0ZET, (at right) while Zaki, 9M2ZAK, at left, along with Champ and Goi look on. Champ then took the microphone and illustrated his presentation with slides and a video taken during his trip to Germany, which had been the second time that he had participated in the WRTC Championships. This year he was joined by Zaki, 9M2ZAK from Malaysia in the Asia team. He explained that he flew to Frankfurt on July 6 with baggage weighing 70 Kg and which had included equipment such as bandpass filters for use in the contest. While in Germany, he visited the Icom Europe office where he met Helmut, DF7ZS who helped by training him in the functions of the Icom 7851 which he would be using in the contest. Then Champ travelled on to Wittenberg, the centre for the WRTC Championships this year and he observed that few Asians had been participating -- with only nationals from Thailand, Malaysia, Japan and Israel. He also praised Benji and Ralf (Benjamas, HS6SSE and DJ5BK, and Ralf Klinger, HS0ZET and DF6RK) who had taken good care of them in Germany. 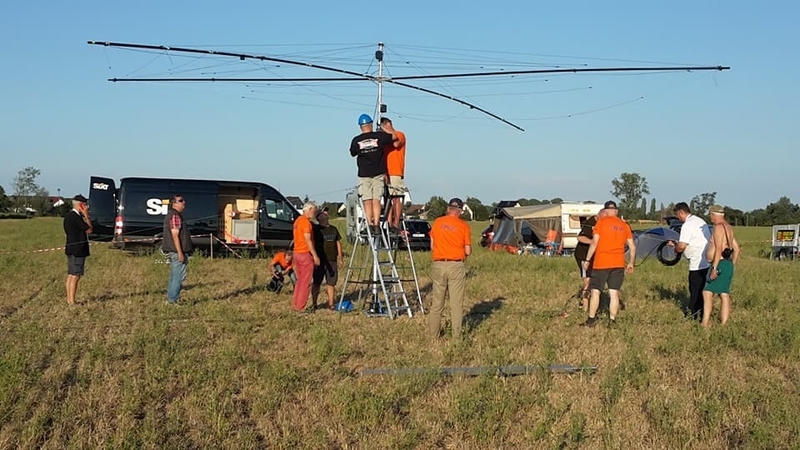 The Spiderbeam antenna which had a problem with a high SWR and the balun and cable had to be replaced during the contest, forcing Champ's station off the air for three and a half hours. The location for taking part in the contest as well as the callsign to be used was assigned through a lucky draw and they did not know the callsign they would be using until 15 minutes before the contest would begin, while the prefix of the callsign assigned -- Y86P -- was rare and had not been issued since 1990, he said. Champ also praised Fred, HS0ZAR and K3ZO, who, along with the PVRC (Potomac Valley Radio Club), had sponsored the tent used during the contest. The antenna used had been a Spiderbeam, while there was a team of four local volunteer hams -- DL1UHU, DL6UD, DL7AT and DL9MWG, with the site manager being DM3BJ. The set up and testing of the station, which was located a long way out in the countryside, had begun one day before the contest would begin. Once the contest was underway, Champ said he did not eat anything, and he had been on the radio non-stop, however, it turned out that there had been a big problem with the antenna balun and the connector which had lasted for three and a half hours. After one hour spent looking up at the antenna, the support team finally took the antenna down and then had to drive for two hours to fetch a replacement, which cost the team some 1,500 QSOs. 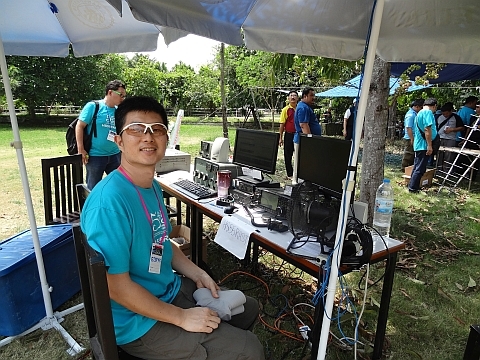 In all, the team made over 2,000 QSOs on both CW and SSB in 24 hours but having been forced off the air cost the team many points and they came in 61st place out of a total of 63 teams. The full results, with Lithuania coming in first place, Germany second and the USA in third place, can be seen here. Champ ended his presentation by saying that he hopes to get a chance to participate in the next WRTC Championships in four years' time because of the antenna problem this year. RAST, thanks to many contributions from donors, both corporate sponsors and individual members, had supported Champ's trip to Germany with a total of 189,000 baht, while Champ had only spent 149,000 baht and at the meeting he handed 40,000 baht back to RAST President Jack who said that the funds would help subsidise the upcoming trip by RAST members to the Tokyo Ham Fair. Jack pulls the names of 10 sponsors of Champ's trip to Germany to participate in the WRTC Championships out of a jar who were the lucky winners of Yaesu hats following Champ's presentation. 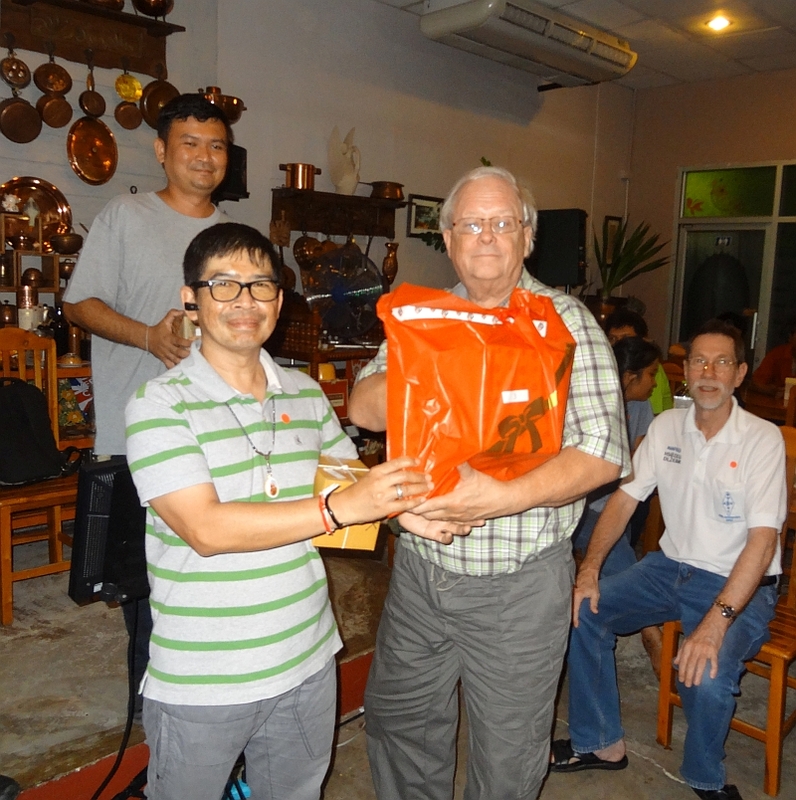 Champ then donated 10 Yaesu hats to members who had donated 1,000 baht or more who were selected in a lucky draw and the meeting closed with Jack thanking Champ for his presentation and for returning the 40,000 baht he had not used on his trip. The next RAST meeting will be on Sunday, September 2, 2018 at Sena Place Hotel. RAST Treasurer Pornpimol, HS0VDX was one of the lucky winners of a Yaesu hat. 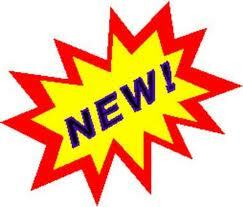 Please click on this link to view the archives of the RAST website for the previous year. 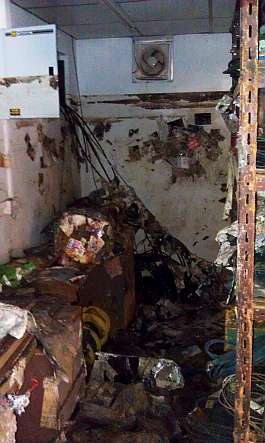 We tell the story of the disastrous 2011 flooding of RAST's club station at the Asian Institute of Technology to the north of Bangkok in pictures. RAST has received generous donations from many individuals and organisations and the station was back on the air in July 2014. We have the story in over 100 pictures here how RAST committee member Champ, E21EIC, his XYL Goi, E20NKB, RAST former Secretary Wacharapol, HS4DDQ and others pitched in to deliver water, medicine and survival packs to flood victims to the north and to the west of the city during the disastrous flooding around Bangkok in October and November 2011. 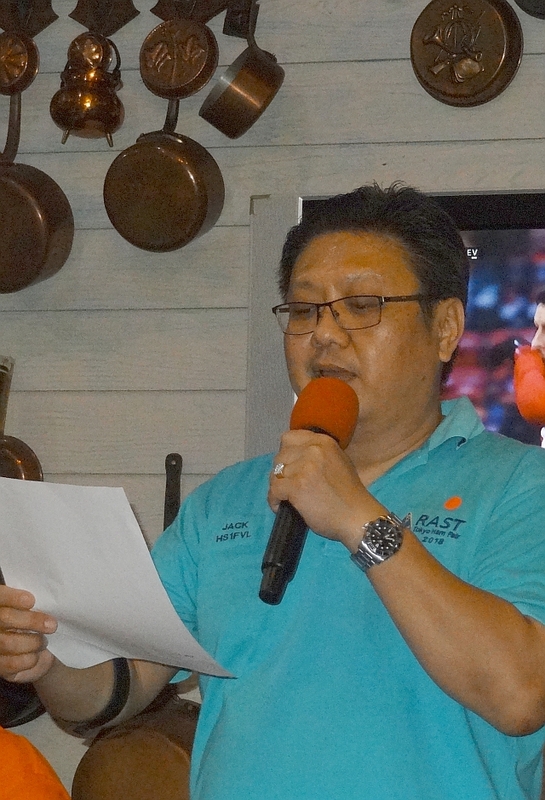 RAST usually holds a public meeting every month on the first Sunday of each month from 11.30 a.m. onwards at Sena Place Hotel and all members and any guests or potential members are welcome to attend and when a buffet lunch is available for 320 baht. There will be no monthly RAST meeting in April, 2019 and the next monthly get-together will be at Sena Place Hotel on Sunday, May 5 at 11.30 a.m. 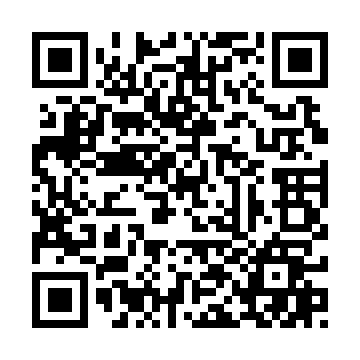 If you are not on the RAST email list and would like to receive occasional emails announcing events and the location of upcoming meetings, please send an email to Tony.waltham (AT) gmail.com with a request. Each Seanet web page maximizes the coverage in photos by combining a total of over 200 photographs in YouTube videos that are displayed at the top of each page. January 2010 to April 2010, including the 2010 New Year party.